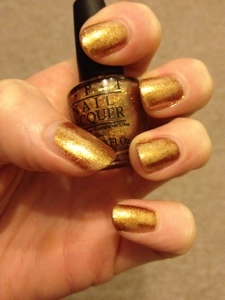 Another from the latest James Bond collection by OPI (can you tell I'm a bit obsessed? ), this is one of the most amazing glitters I've come across. I actually can't stop looking at my nails. As the name suggests, it's gold, but with a sort of foil finish. It has very fine glitter particles that build up to a solid colur, rather than the usual glitter top coats that are so popular. One coat is pretty transparent, but this builds up very quickly and although these have 3 coats, I could have got away with two. I think this is a perfect polish for the party season, but I'll be wearing mine this weekend just to brighten up the dreary days. I got this as part of the Bondettes mini collection but I'm thinking about getting the full size as I can see me wearing this a lot over the next few months. 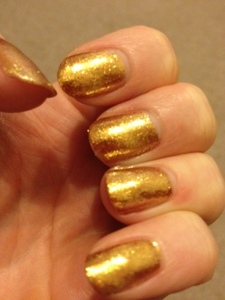 I love gold nail polishes. This shade looks very pretty. And I think you are right. It would be perfect for the holidays and all of the holiday parties. 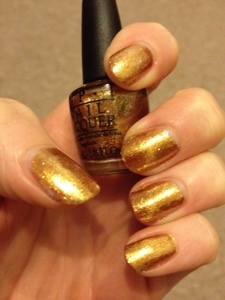 I love gold nail polish, this one is gorgeous! I saw this on another blog, and I want it so bad!! I think i'm going to get the full size as i love it so much!